At the Geneva Auto Show HAMANN has just debuted their new tuning program for the Mercedes Benz AMG SLS dubbed the “HAMANN Hawk“. I think the name is apt since this program kind of makes the SLS look like a Klingon “Bird Of Prey” star ship! Before you ask, no they wont throw in the matte gold wrap when you pick up the program. However, they do include the aero package, forged wheels, titanium exhaust, and ECU tune (the last two bump the power output to 636HP). As usual HAMANN treatments can be hit or miss. 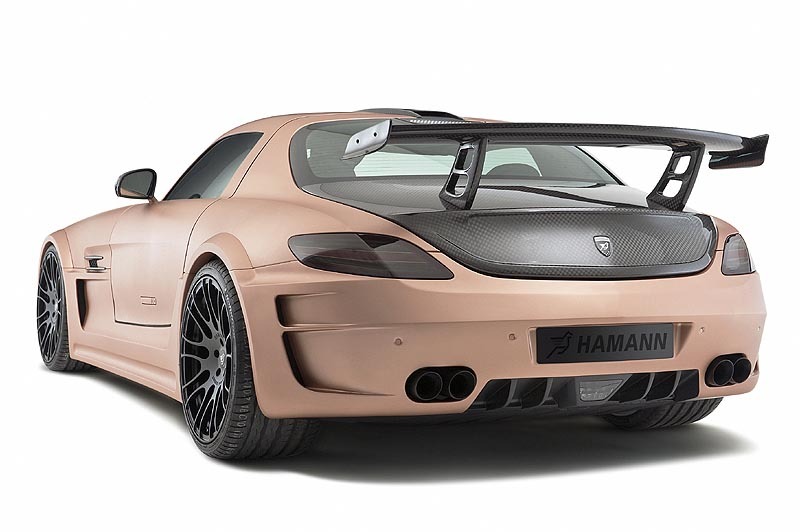 So what do you think about the HAMANN Hawk? Hit? Miss? 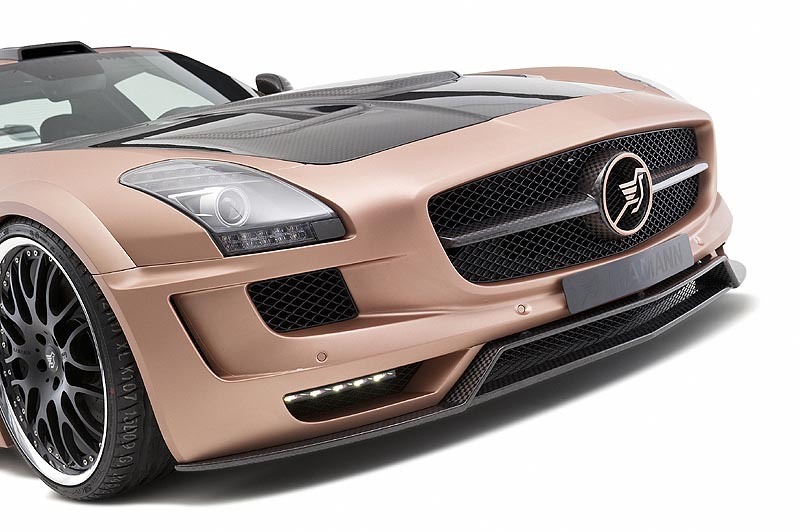 An engine bursting with power wrapped into an exciting car body design coloured in Everose Gold. 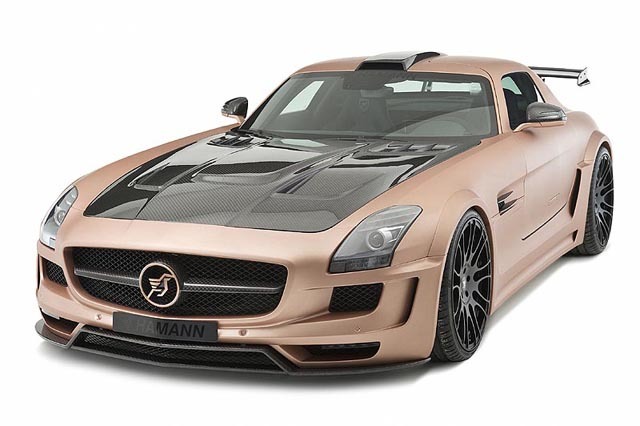 The Southern German specialist for exclusive automobile refinement, HAMANNMotorsport, turns the wing door Mercedes SLS AMG into the HAMANN HAWK with new plumage and significantly sharper talons. Already in its basis version, the SLS provides a significant engine output. But the HAMANNengine department puts some additional power reserves into the V8 engine. The core part of the power enhancement is the high-performance exhaust system made out of titanium. In combination with new manifolds, sports catalysts and a sports air filter, this system also renders the earthy and powerful sound of the 6.2 litre aggregate. The components are precisely adjusted with the help of a new engine characteristic map for motor electronics. With a top performance of 636 hp / 468 kW and a maximum torque of 680 Nm at 4,850 r.p.m, the HAMANNengine exactly meets the wishes of its sports ambitious clientele. The performance enhanced wing door automobile provides first class measures. In race start mode, the two-seater accelerates from 0 to 100 km/h in only 3.6 seconds and with a top speed of 320 km/h, the HAMANN HAWK also surpasses the basis model. The superior driving performance is matched with a striking appearance and aerodynamics tested in the wind tunnel. The HAMANN HAWKfront apron replaces the serial bumper and due to its shape it reduces the uplifting forces at the front axle. Larger air inlets in connection with a new LED lights unit give the two-seater an even more dynamic look. In addition, the enlarged air inlets provide better access for the engine’s increased need for fresh air. Subsequently, the air is drawn out of new bonnet made of checkered flag carbon. Striking wing, 60mm on each front side and 70mm on each rear side, already render an impressive appearance even while the car has not started moving yet. Side skirts make the two-seater look additionally lower and more stretched and underline the rims. In order to perfectly balance out the downforce of the front- and rear axle, HAMANN gives the SLS a rear wing also made of checkered flag carbon. The new rear apron with the diffuser enhances the air flow under the bottom of the car and provides room for four enormous end pipes each measuring 90 mm in diameter. In order to perfectly combine comfort and control, HAMANN uses the single-part, especially light forged wheels “Unique Forged Anodized“ in 21 inches. These are fitted in 9Jx21 with tyres measuring 245/30 ZR 21 at the front and 12.5Jx21 with tyres measuring 345/25 ZR 21 at the rear axle. The coilover kit has been especially refined for the HAMANN HAWK. Equipped with four height-adjustable dampers and four progressively wound springs, the centre of gravity can be lowered by up to 30 millimetres. HAMANNentirely redesigns the interior of the SLS and turns it into a VIP lounge with motorsports characteristics. Most delicate leather and ultra-suede, applications and embroideries replace the serial interior. HAMANN additionally adorns the air inlets, door sill protectors and centre console with checkered flag carbon. Black anodized aluminium pedals render a comfortable grip. The technical highlight of the new interior is the new steering wheel which has been ergonomically redesigned.